If you had five minutes on stage what would you say? Would you talk about your latest passion? Describe the trip of a lifetime? Teach a hack? We’ll find out at in this high-energy, fast-paced, technology show-and-tell. Any topic is fair game as long as it’s interesting, from technology to culture to business to science fiction. Speakers are limited to 20 slides, which automatically advance after 15 seconds—that’s the fun of Ignite! Ignite will be hosted by Sarah Novotny, Justin Martenstein, and Tim Berglund. Speak! How to talk in public and not wreck your voice (Florian Haas) – Know how most advice for public speakers deals with delivery, choice of words, and slides? How does that help you if you just woke up for a presentation you give in the morning and your throat is sore and feeling terrible? And how often have you come off a talk practically mute? Here’s what to do if that happens, and what to do to not let it happen. Your project’s brand is more important than the code! (Shane Curcuru) – From rockstars to collaborative committers, everyone wants to write the coolest code – but who’s managing your brand? And what is your project’s brand, anyway? I know you think your project is the hottest thing ever, but if the rest of the world’s never heard of you, why should they bother? When a Tech Writer becomes a Systems Administrator (Mike Jang) – After the departure of the administrator of the office server rack, I was asked to step in. As a technical writer, I’m not the usual corporate systems administrator. What did I need to know? How do I set it up for my audience of (developers / support engineers / non-technical users)? This presentation is targeted at any technical user who might be drafted (or volunteer) for sysadmin duties. Secret Tech Behind Massive Social Movements: Customizable Platforms (Vidya Spandana) – While there are common needs across all core users, each country, each cause has its own unique needs that most platforms cannot support. Enter customizable platforms to allow people with little tech expertise to use a tool that feels like it was built just for them. Ushahidi’s most successful deployments (ie. Kenyan Election Monitoring, Haiti Hurricane Response) are a result of custom platforms. OpenAerialMap: Planes, Drones, Satellites and Open Access (Kate Chapman) – Previously access to imagery of the earth was mostly inaccessible to most people. Now with a great variety of ways to collect imagery, as well as companies and governments opening their data more imagery is now freely available. Hosting and processing such data is still a very technical process. OpenAerialMap seeks to provide a simple open way to process and provide imagery access. Watching Guys Fire Rockets: Tracking the Syrian Conflict Using Social Media (Jonathon Morgan) – Nearly 60 journalists have been killed in the past two years documenting the conflict in Syria. What if there was a way to monitor the crisis without being caught in the crossfire? See how we worked with a specialist in social media arms tracking to rip data from 1,700 Facebook pages and YouTube channels, and build a map that rivals those produced by NGOs on the front lines. Land Speed Yo-Yos (Marinus Damm) – Mixing mobile programming with recycled auto parts and high speed, Marinus The Mechanic pulls together Android code, IOIO interface boards, linear potentiometers, and a 175 m.p.h. Saab. Opensource at Booking.com (Andrea Guzzo) – A brief overview of our approach in terms of employing opensource solutions in our infrastructure and contributing back. 102% of everything is crap (Bron Gondwana) – A quick dive into the scary world of copypasta code which our world is built on. It works, but for all the wrong reasons. Why Is Everyone Hating On Operating Systems? (Brian Proffitt) – Containers, jails, gears… all the hotness in DevOps these days seems to be about making the operating system irrelevant. And why not? From a developer’s point of view, the OS is a major PITA. Is it time to send the venerable OS to another mass burial at Alamogordo, or is the way we look at operating systems changing to something that keeps the OS from going the way of Atari game console? Walk n’ Doc: Walkup Contributions to Your Documentation (Everett Toews) – A common complaint against many open source projects is documentation. Insufficient, incorrect, non-existent, hard to find, and difficult to update are things we typically all hear. There are a lot of different ways to tackle these problems. There’s no silver bullet but one of my favourite tactics is lowering the barriers for absolutely anyone to contribute documentation. 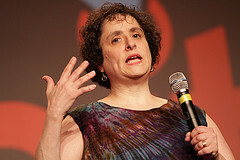 Lessons about Community from Science Fiction (Dawn Foster) – Communities are one of the defining attributes that shape many projects, not unlike how Asimov’s 3 laws of robotics shape the behavior of robots and provide the checks and balances that help make sure that robots and community members continue to play nicely with others. This is a fun session, but it is focuses on real community lessons and tips as told through science fiction. @Haneef – the call for Ignite presentations closed back in May. 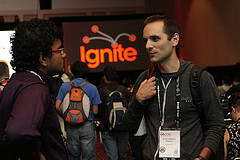 Where do we register to present at Ignite?